Anti-Twin examines all files within the selectable basic folder (normally also sub-folders). Anti-Twin searches for files on local data media, i.e. the hard disk, USB flash disks and memory cards as well as in shared network folders. A slow network connection might slow down the search in a network and may have very negative effects on the software performance when comparing file content. Anti-Twin can neither search the Internet for files nor servers connected via FTP, since the search requires a standard Windows shared folder, which can e.g. be realized by a VPN tunnel. Warning: Duplicate files in network directories and on removable media cannot be sent to the recycle bin, since the Windows recycle bin is only designed for internal drives. This could even delete files permanently. Instead, select the “Move” option which creates an “antitwined” folder for the files on the relevant drive. A second path can be included in the search process. This is an optional function and could e.g. 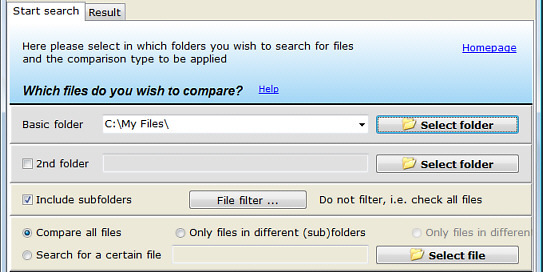 be used to compare a folder on the hard disk with a folder on a CD-Rom (back-up copy or archive). The files already archived on the CD-Rom can then e.g. be deleted from the hard disk to increase the hard disk space. When working with two paths, make sure at all costs that the two path names are not only different notations for one and the same folder. This may e.g. happen when using a local path as for example C:\Folder1\ and a network path \\Computer\Folder1\. In such a case, i.e. when addressing the same file twice with different path names, the program could erroneously consider one single file as its own duplicate and then get lost when deleting the supposed duplicate. This is something you surely don’t want to happen!